If you prefer traditional hand stamps, Notary Supplies Online has got you covered. 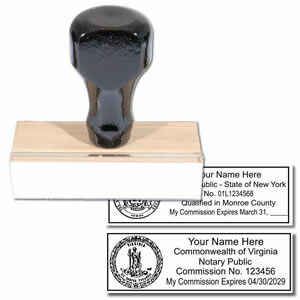 All of our Traditional Notary Rubber Stamps are 100% made in the United States. Both reliable and cost-effective, Traditional Notary Rubber Notary stamps can be used with any color rubber stamp ink pad. All of our Traditional Rubber Notary Stamps are handcrafted and carefully assembled by our detail-oriented team in Richmond, Virginia. Questions about Traditional Rubber Notary Stamps? Contact us! The Official Round Notary Public Rubber Stamp is a great addition to the traditionalist's tool box. With the use of an additional ink pad, you can create infinite impressions. Our Official Round Notary Public Rubber Stamp is guaranteed to meet all state board specification. Our Official Rectangular Notary Rubber Stamp is a great notary stamp for tricky documents that do not offer much room for a notary seal. The Official Rectangular Notary Rubber Stamp is handmade in the United States. With just the use of an additional rubber stamp ink pad and a little pressure on the sturdy wood handle, you can create quality impressions that are state board certified. Have you ever authenticated and confirmed the signature on a document and had to hand-write all of the state-required acknowledgment verbiage? We've been there. We created this Notary Acknowledgment Rubber Stamp so that you can easily have all of the notarial information clean and professional looking on your document. As a Notary Public, you are expected to act in a trustworthy and professional manner. 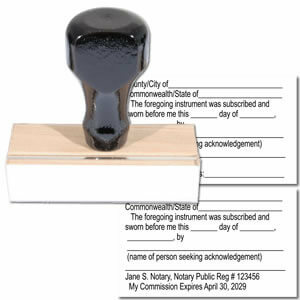 With our Notary Jurat Rubber Stamp you will never forget or have to hand-write the state-required form when administering an oath or witnessing a signature ever again. 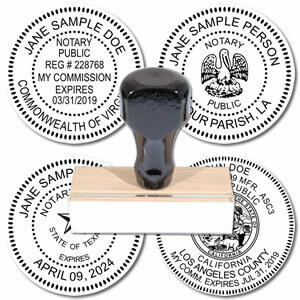 This traditional notary rubber stamp has all of the information you will need on it when you are performing a jurat notarization. 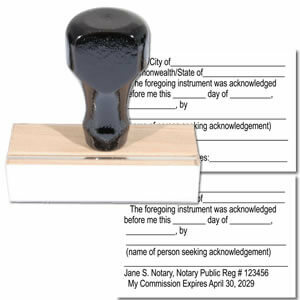 The Notary Jurat Rubber stamp provides ample space provided to fill in your personalized information. 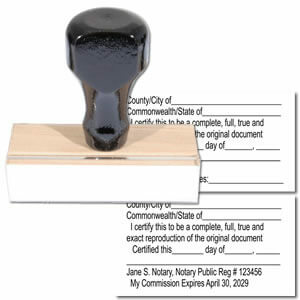 Our Certified Copy Rubber Stamp is a great tool to have as a notary public. Throughout your commission you may be asked to make copies of important documents. It is a big responsibility to make sure the certified copy is a true replica of the original. To ensure the authenticity of your certified copy your state may ask you to use a Certified Copy Stamp when you notarize the copy. This American-made Certified Copy Rubber Stamp will help you get your job done efficiently with a professional touch.